Housing Action is thrilled to announce the addition of four new agencies to our Housing Counseling Intermediary network: Latin United Community Housing Association, Open Communities, Total Resource Community Development Corporation, and Community Investment Corporation of Decatur. 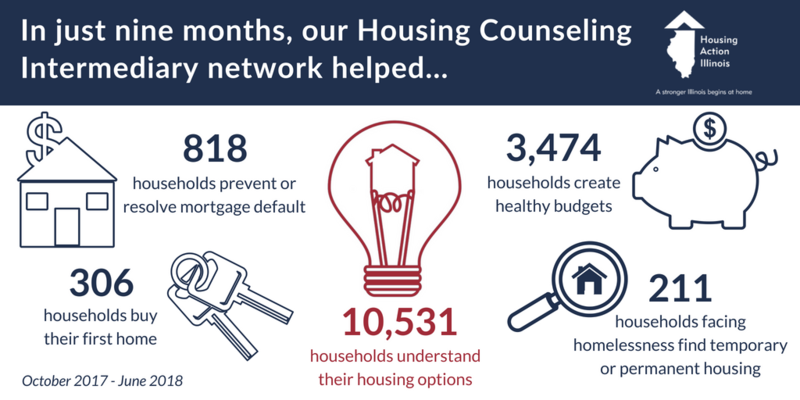 With these additions, our network has grown to 30 HUD-approved housing counseling agencies who serve low- and moderate- income communities across Illinois, Indiana, Missouri, and Michigan. Their expert housing counselors provide guidance on home purchase or rental, financial management, mortgage solutions, discriminatory or predatory practices, preventing foreclosure and homelessness, and more. Housing Action Illinois became a HUD-Approved Housing Counseling Intermediary in 2014 in order to support this critical work. As an Intermediary, we aim to build the capacity of these vital housing counseling agencies. We provide pass-through funds and assist our affiliate agencies with reporting, training, and identifying funding opportunities. Get to know our new affiliates. LUCHA has been empowering people against the struggle of housing injustice and discrimination since 1982. While serving over 2,000 low- to-moderate-income clients per year through housing counseling services, LUCHA has also been advancing housing as a human right through its community organization and advocacy. They built and currently manage 198 affordable rental housing units in Humboldt Park, Logan Square, and West Town and provide numerous educational services to predominantly Latino and African American communities of the Northwest side of Chicago. Situated amidst Chicago’s Northern suburbs, Open Communities draws upon its roots in the civil rights movement to promote nondiscriminatory housing practices. Their services extend to homeowners, tenants, and landlords alike to prevent housing discrimination, foreclosures, and unhealthy tenant-landlord relationships. By educating clients on their rights, responsibilities, and available resources, Open Communities helps make affordable housing a reality in communities that are historically lacking in diversity. In just under 20 years as an organization, TRCDO has made substantial gains in its efforts to empower individuals, families, and communities. TRCDO offers housing support, utilities and energy assistance, a food pantry, and youth and health services. The organization served nearly 40,000 people in 2016 with $5.7 million dollars of tangible assistance allocated to homeowners and families in need. CIC of Decatur is a lead investor in neighborhood revitalization projects that focus on the acquisition, rehabilitation, and preservation of affordable rental housing. Their investments are sourced from a variety of private, public, and philanthropic entities. CIC of Decatur is certified by the United States Department of the Treasury as a Community Development Financial Institution.